After a long hard day at the European Council in Brussels, where the outcome was anything but foreseen, we get there in the end, with the final conclusions on Brexit. Central to these, the European Council agreed an extension to the Article 50 period, to last until 22 May 2019, conditional on the Withdrawal Agreement being approved by the House of Commons next week. If the MP collective doesn't do the deed, the extension gets cut to 12 April – the last day on which the UK can move a writ to set up the European Elections. Nevertheless, the European Council expects the UK "to indicate a way forward before this date for consideration by the European Council". As if it was needed, the Council reiterates that there could be no opening of the Withdrawal Agreement, and declared that any unilateral commitment, statement or other act should be compatible with the letter and the spirit of the Withdrawal Agreement. Then, by way of insurance, it called for work to be continued on preparedness and contingency at all levels for the consequences of Brexit, "taking into account all possible outcomes". In some respects, this represents a climb-down from the original position of a "sudden death" extension to 22 May on the condition that the Withdrawal Agreement was ratified, with the prospect of a no-deal Brexit by the end of next week in the event of another refusal. Given the apparent response to Mrs May's lecture yesterday, that was looking to be the likely result but, at the very least we have two weeks more within the warm embrace of Mother Europe. What that then does is give the government another opportunity to consider holding European Elections, to pave the way for a request for a further, longer-term extension. All of a sudden, the uncertainty which looked like ending is back on the table again. However, if Mrs May sticks to the stance of no elections, and the MP collective hasn't delivered, then we're out with a no-deal only two weeks late, and precipitated into a crisis which will take considerable government resources to manage. If we do commit to elections – and swallow the humiliation entailed – that would still leave open the requirement for the UK "to indicate a way forward" some time before 12 April. This, presumably, would come in a formal statement from Mrs May, shortly after her third defeat in the Commons, whence she would have to come up with plans for a successful fourth attempt. Bearing in mind that it is going to be hard enough getting the approval of the speaker for a third vote, it is going to be harder still to get a fourth – and probably with less chance of success than any previous attempt. On this basis, the "way forward" condition from the European Council seems to have the character of a back-covering exercise, with little expectation of it being fulfilled. Some might see it as blame avoidance – going through the motions of being open to further discussions, even though there is no realistic expectation of anything substantive coming from them. That would tend to suggest that parliament's rebellious mood – if it is maintained – will spell the end of the Brexit process. At the third vote, we will be out on our necks and struggling to keep our heads above water in a no-deal world. That would certainly be the intention of Emmanuel Macron, who has been especially robust about limiting extension options. 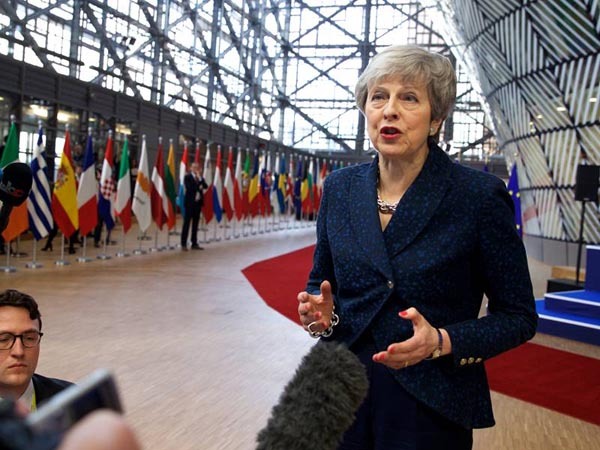 A possible alternative might be for Mrs May to resign in the event of a third failure – third time lucky, some might say – leaving her successor to come up with proposals to break the logjam. A new face at the table, however, doesn't make the task any easier, and we could end up with a hard-liner who wants to take us out without a deal. One idea being canvassed is mass defections from the Conservative Party to the independent group, with the subsequent formation of an opposition coalition fronted by Mr Corbyn. This could see Mrs May facing a vote of no confidence and a new government in place to deal with Brexit. Somehow, though, that idea seems less than plausible, but then not many of us thought that dropping out of the EU without a deal, at the very last minute, was ever a possibility. Not for nothing did I write yesterday that we find ourselves having to learn that the inconceivable is part of the new norm. Then, always looming in the background is the last-minute prospect of the government revoking the Article 50 notification, especially as a petition to that effect has now passed two million. Even this is not as straightforward as it appears, requiring subsequently parliamentary cooperation to repeal the Brexit legislation, it remains a possibility right up to the very point when we formally leave. Basically, therefore, we are no further forward than we were yesterday, with still no real idea of when we are going to leave, or under what terms – or even whether we are going to leave at all. Even in respect of narrower events, we don't even know if we will have the same government by next week. At this moment, we're not even sure when the third vote will be, other than it will be next week, pencilled in for the Tuesday. On the Monday, we will get the traditional prime minister's report from the European Council and it is at that point that we expect Mrs May to make her intentions clear. Much of the media are taking the view that her Wednesday speech has "backfired", and the Guardian even went so far as to call it "shabby, shameful and a form of national sabotage". As far as it goes, there can be no question that the Withdrawal Agreement is very far from desirable, and that Mrs May's clumsiness in ruling out continued membership of the Single Market has been responsible for many of her woes. But parliament can't walk away from this process and take no responsibility for it. Its own lack of cohesion and its inability to pursue a credible alternative have contributed to the prime minister's lacklustre performance. Now that the Withdrawal Agreement has been finalised, though, there is no option other than – albeit with extreme reluctance – to support it. This is not with any enthusiasm and the very fact that this is all we have on offer represents a chronic failure on the part of Mrs May to do any better. But just because the prime minister has failed to perform adequately is no excuse for making a bad situation worse. It seems to me, therefore, that there is something particularly precious in the indignation being expressed by the MP collective. With their bruised egos on show, some are even resiling from their previous positions of support, just because of the tone of the speech. One wonders, though, how they expected the prime minister to react. With the Withdrawal Agreement blocked twice, and no alternative in sight – and very little sign of success on the horizon – a make-or-break attack on the source of the blockage hardly seems inappropriate. Even where there is some attempt to craft an alternative, as in the Common Market 2.0 plan supported by Stephen Kinnock, it is extraordinarily inept. Hailed as "the fastest route to Brexit", it is anything but. The authors are vastly under-estimating the complexity of tailoring the EEA Agreement to the needs of the UK, neglecting the need for multiple additional bilaterals and obviously unaware that a working agreement would require entering uncharted waters. It is all very easy to come up with a fantasy option in principle, but the devil is in the detail. The supporters of this idea have simply not addressed the reality of that detail and are promoting something the true nature of which they know not, with no idea of how to get there. Furthermore, it was never the case that the Efta/EEA option could be the final cover. It it is not a suitable long-term solution, and therefore requires an additional framework to legitimise the effort required to enable the adaptations needed to make it workable for the UK. Eventually, any scheme will have to deal with the integral flaws of the EEA Agreement, if it is to be a long-term, stable solution. Bearing in mind that the original EEA agreement took ten years to evolve, it is most unlikely that we could conclude a revised agreement within two years. We could be looking at a process which takes many years more. It is worth striving for, but is not a quick or easy fix, and will not work if it is treated as one. When one thinks that this is the best idea that the MP collective can come up with, they are hardly in a position to complain about Mrs May's performance. In a nutshell, they are all as useless as each other. Until or unless MPs can themselves craft a credible solution to Brexit, they are in no good position to stand on their pride and complain about how they are treated – by the prime minister or public at large. Her failure does not compensate for, or excuse theirs. And the one thing for sure is that, once the effects of a no-deal Brexit become apparent, the public will not be kind in their assessment of those who brought it about. Also in the frame is the MP collective. They wanted their "meaningful vote" and now they've got it, they can take responsibility for it. If MP Anna Soubry feels unable to go home because of death threats over Brexit, she had better get used to the idea of booking long periods away from home – along with her other colleagues. Threats are indeed regrettable but a fact of life for those in the public eye. If MPs decide to inflict pain on the citizens of this country, they can hardly expect an easy ride. Going back a bit, I recall my father – a schoolmaster – once being threatened with a beating by a gang of boys. He responded by publicising details of the route of his walk home, complete with timings. Our "principled" MPs might face sterner challenges, but nonetheless, there seems a curious detachment between actions and consequences. None of the political classes come well out of Brexit. They really cannot now expect business as usual.